my first time to cornerhouse. i had been to au jardin & taken the degustation several times previously but not since cornerhouse took over. 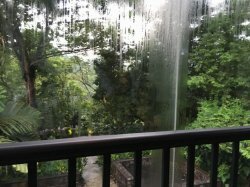 looking at my previous post, the last time we were here was for the new year eve dinner on 12.31.2016.
i asked for one of the 2 verandah tables seating looking out at the gardens. it was really nice. the amuse bouche comprises 3 items. couldn’t really remember…they were all good la! this one quite unique taste. this a salty fish cracker with tobiko. great! last a amuse bouche – bitter cucumber terrine. we enjoyed all of the them. the first course, carabinero prawn, scarlett prawn from mediterranean, was simply awesome! the variations of seasonal tomatoes, with basil, olive oil & another falvour were sublime. later i saw on naked fins a nice pic. it was a very large prawn, and in some sites they mentioned it tasted like lobster. 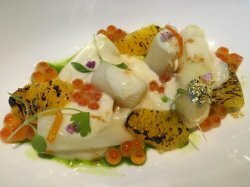 second course was white asparagus with a 24mths comte cheese & ikura. the white asparagus (confit maybe?) was par excellence, very tender & sweet. overall while the dish was very tasty & enjoyable, it made less impression than the tomatoes (& prawns). 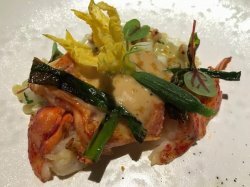 lobster was firm, sweet, tasty, riso (a risotto like pasta) was great & the sauce was just fantastic! (from bottarga the salted fish roe i think?). 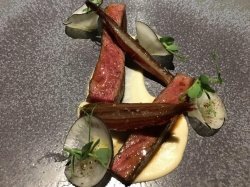 the 4th course, japanese toriyama wagyu was like any top jap wagyu, simply fabulous, so much better than australian or USA, & horseradish mash was excellent with the beef. the last course, chocolate earl grey dessert, was good. 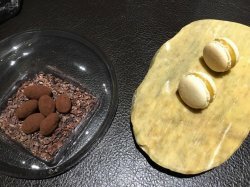 i mean the chocolates were great really, the sorbet too, among the best i guess, not exactly my favourite dessert. wife & i not particularly hot on chocolates & if chocolate i prefer the really dark intense chocolate type rather than just smooth with earl grey flavour etc…. petit four was pretty good. they charged for coffee. 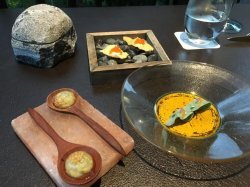 i always felt coffee should be just included in a degustation & green tea too in a japanese kaiseki, a touch of class not to charge extra…anyway just my persona views..
dinner 2xS$188pax + 2 glasses of wine came to S$513. it was an excellent dinner very enjoyable so money well spent. 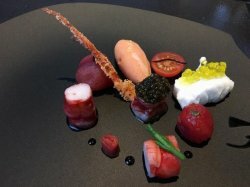 looking back at the 2013 au jardin NYE degustation, i think that offerred a bit better value not this time we had lobster. hard to compare i guess.